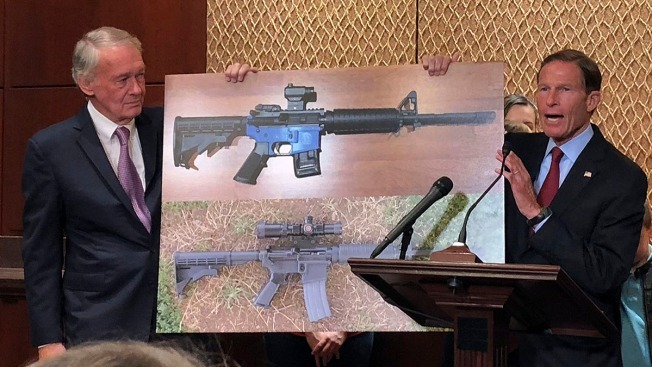 Sen. Edward Markey, D-Mass., left, and Sen. Richard Blumenthal, D-Ct., display a photo of a plastic gun on Tuesday, July 31, 2018, on Capitol Hill in Washington. The number of "ghost guns" continues to rise, police say, prompting officials to fear a new era of guns that law enforcement can’t track, NBC News reported. Parts are selling out for ghost guns, which are homemade assault-style rifles that exist under the radar of police. The parts fall short of meeting the federal definition of being guns themselves, but together they can be shaped and fastened into full-fledged killing machines. The rise of 3D-printed weapons and ghost guns has lawmakers so alarmed that they're calling for stricter regulation. Neither printed weapons nor ghost guns have serial numbers that would enable law enforcement to track them and both are available in plastic, which could bypass metal detectors. On Tuesday, a federal judge granted a request for a temporary restraining order that prevents a man behind one Austin, Texas-based nonprofit from publishing plans for making the untraceable guns.